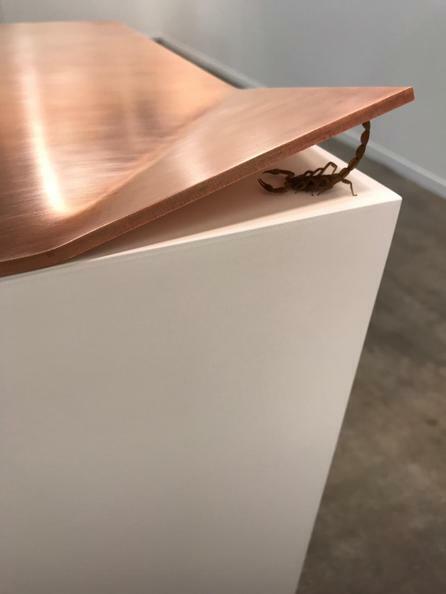 In an exhibit that invites every visitor’s attention and participation, Fernando Ortega presents a series of sculptures that continue his analysis of animal behavior and human nature. Ortega introduces four copper plates, each half a centimeter thick, to represent fixed, concrete thought. Copper surrounds us as the archetypal energy conductor, symbolizing connectivity and access to information. In these sculptures, the viewer’s curiosity and meticulous observation serve as a switch to activate other levels of interpretation, breaking with the closed structure of the metal sheets. Subtle distortions in the plates suggest some hidden entity exerting force beneath the surface.